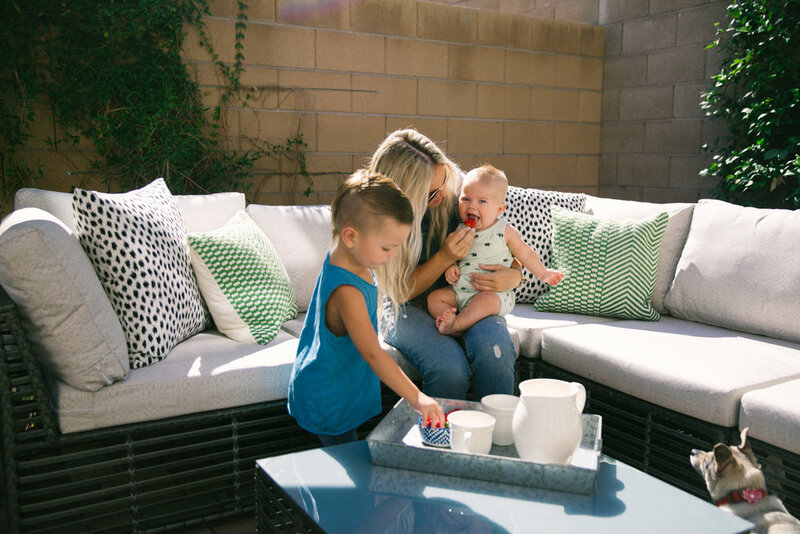 As a mom of three boys, a backyard with a great outdoor space is a MUST! We spend more hours outdoors than in, and I'm totally ok with it. They are boys they are supposed to be outside, digging in the dirt, jumping on the tramp and finding bugs. With them always being outside, I must be as well. Why not have a place I want to be. I wanted an outdoor space where our family could spend time together, roast marshmallows and talk about our day. That's why I chose Sunbrella to design my patio set, and Wayfairs design, and I am obsessed! It's so me, and durable enough for all my boys! "We passionately believe that textiles are the most important ingredient in exceptional design, comfort and living." I couldn't agree more, the palmation pillows were the exact touch of glam I was looking for.